The kitchen cabinet painting projects that we’ve quoted this year run from $1,550 for a small kitchen up to $9,400 for a very big and complicated job. Generally speaking, the more cabinet doors and drawer fronts that you have, the more expensive it will be to paint your kitchen. The base of every job is the same, how big is the job? For us, we judge the basic size of a job based off of how many cabinet doors and drawers there are for us to remove, paint and reinstall. 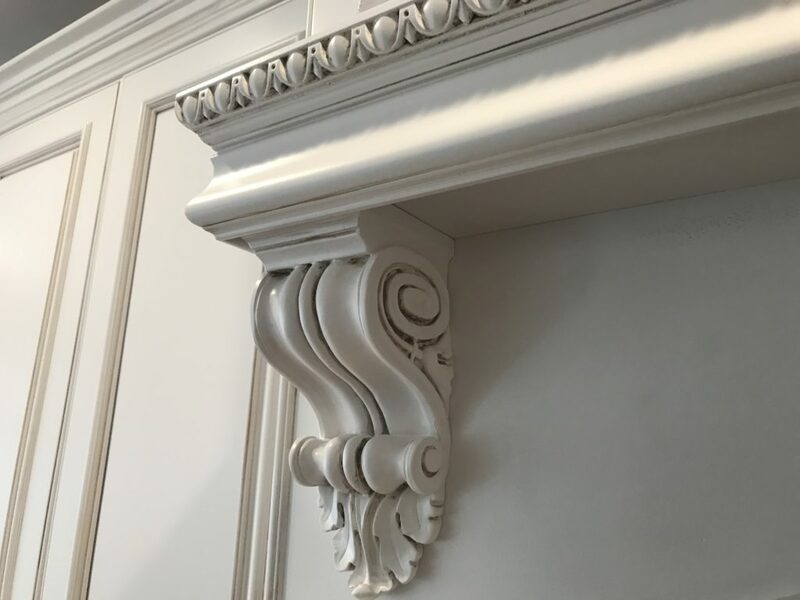 Some other things can get entered into the equation, like how far away the job is or if there is a lot of extra woodworking details (see image) that need additional attention from the painters who paint the cabinet boxes in your home. Because 2 Cabinet Girls is the only company around that is willing to give you a quote without any strings attached, let’s get into the details of where our costs come from. We order the paint color you picked out. We make sure the paint crew in the shop has enough and that the paint crew coming to your house has enough. Door removal crew drives to your home and removes all doors and drawers taking time to mark every door, hinge and drawer so we can put each piece right back into the same spot we took it out of. The doors and drawers are brought back to our Apex shop that same day and the prep team gets started on them. Some jobs require us to fill old holes in the doors if the hardware is being changed. The prep team handles all those special requests. After cleaning and sanding the pieces, they are brought over to our in-house spray booth. If pinstriping or glaze is needed, it’s done by hand at this point. 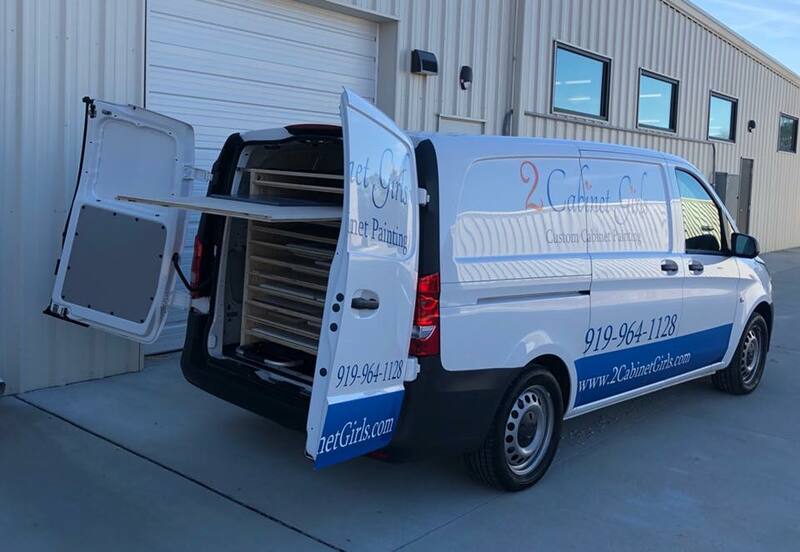 Over the next few days our professional spray team goes to great lengths to apply multiple coats to give your cabinet doors and drawers a factory finish. Around the same time the in-home painting crew is dispatched to your home to get started on the cabinets themselves. This group of talented ladies prep, prime and paint the cabinet boxes over the corse of a day (or two if the job is big or complicated). We’ve been refining this step over the last 5 years to the point where our brush work is almost as smooth as other’s spraying. If pinstriping or glaze is needed on any of the features within the kitchen, those are done by hand at this point. Once we’re done painting the cabinet boxes, we send out the install team to install your freshly painted cabinet doors and drawers back where they belong. Although this seems like a simple step, it’s anything but. We’ve had our van specially outfitted to make sure nothing damages the new paint. The install team is as good as you’ll find at handling everything gently and getting your kitchen to look it’s best. If anything does happen during the install phase, they have everything they need to touch up any nicks or bumps like it never happened. If anything crazy were to happen, 2 Cabinet Girls carries a 2 million dollar insurance policy that covers you. If you’re interested in finding out what it would cost to have your kitchen cabinets professionally painted without any obligation or pushy people bothering you, check out the world’s easiest cabinet painting quote form – just count up your cabinet doors and drawers and well give you a ballpark estimate. If you’re a visual person (but don’t feel like counting your own kitchen cabinets) and want an idea of how much it will cost to paint your cabinets how’s this? See the image below? 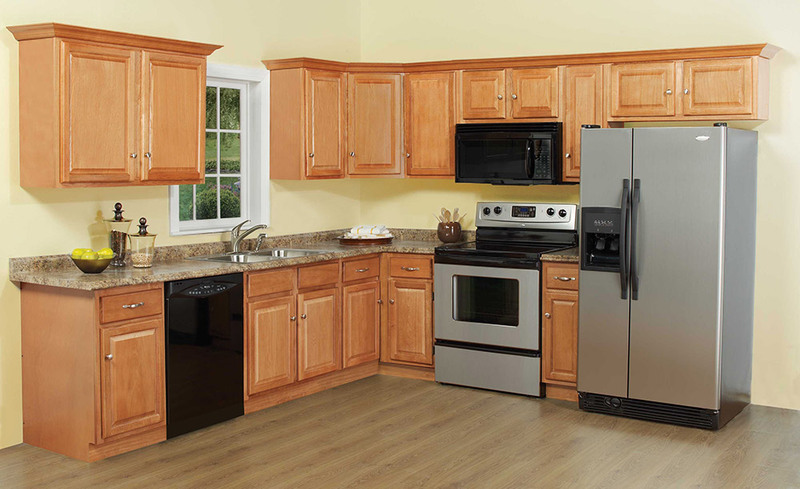 That stock image from a cabinet company would cost about $1,800 to paint. This kitchen could be painted for about $1,800. Sometimes we talk with homeowners who want to have their kitchen cabinets professionally painted, but have budget constraints. After talking with them for about 15 minutes we almost always find a solution. The leverage you have is related to how much of the work you are willing to do yourself. The biggest savings comes from you investing your sweat equity into painting the base cabinets yourself. We would still come and remove all the doors and drawer fronts to spray at our shop, but then you would take on the task of painting the cabinet boxes that are attached to the walls. As you can imagine, this task’s difficulty can vary depending on your cabinet set-up. Some cabinets are 95% doors and you can barely see the face frames behind them, others have more decorative pieces and complicated lay outs. You can see what’s involved in our blog post about how to paint your own cabinets – you would have to jump in at step #6. If you’re willing to remove all your doors (and hardware) and drawer fronts (and hardware) and drop them off at our Apex location and also take responsibility for picking them up and re-installing them yourself you can cut the cost a little bit. I’ll be honest when I tell you that although removal goes quick, re-installation is both nerve-racking and time-consuming. As you can imagine, there are dozens of combinations of tasks and time that a handy homeowner can take on to save a little or a lot. If you’ve read this far and decided you can do the whole job yourself, you should try it. It’s not rocket surgery, it takes patience, an eye for detail and a lot of room to spread out. If that sounds like you, check out our DIY kitchen cabinet painting guide.